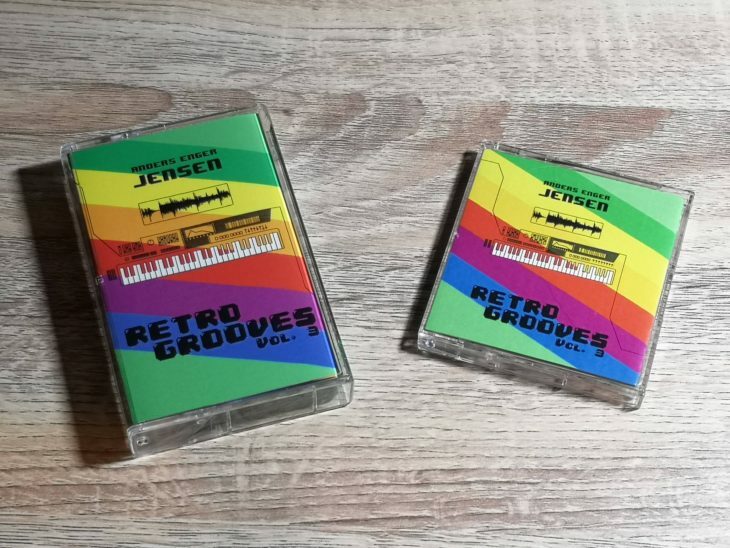 Retro Grooves 3, a MiniDisc release in 2019! 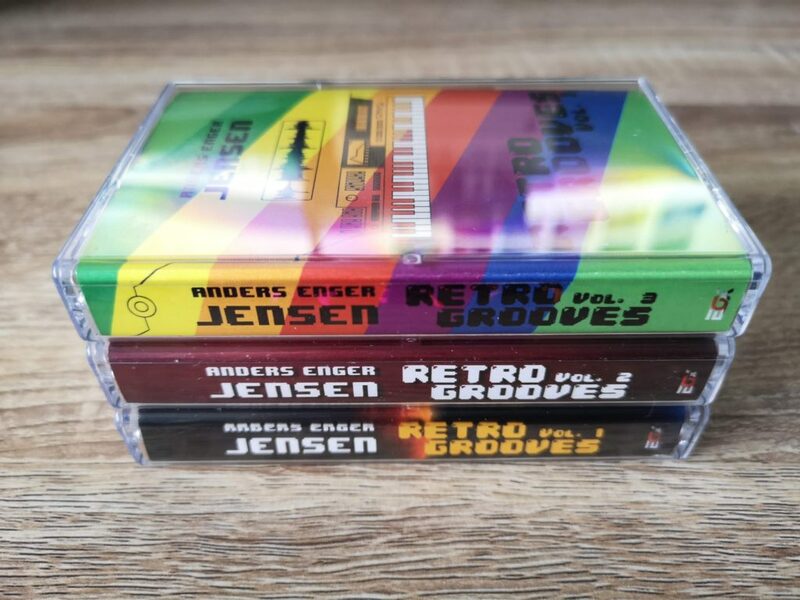 As a fan of Anders Enger Jensen’s other releases I’ve been looking forward to Retro Grooves 3 for quite some time now. What I was not expecting at all was for him to release this on MiniDisc! When he emailed me to let me know it was coming out on this format I just had to get it, as well as the cassette version! 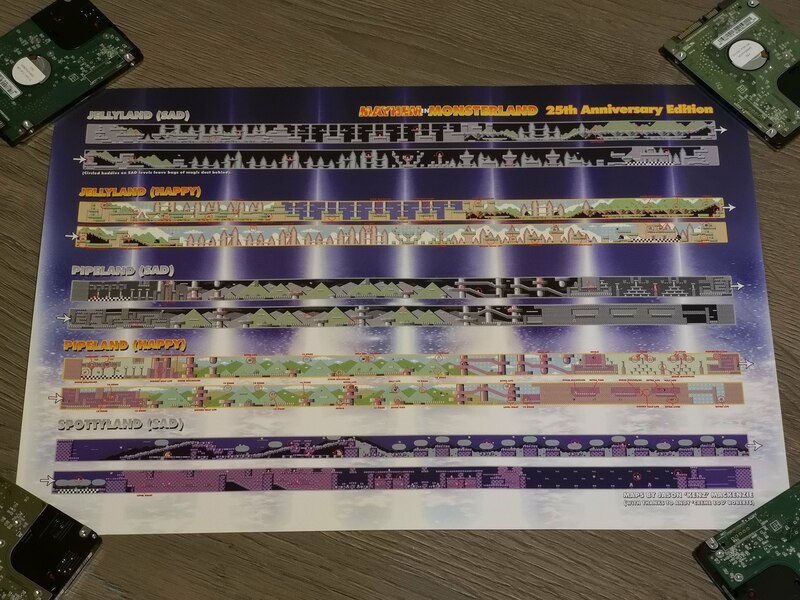 Both versions are really professionally presented with full colour inlays that unfold to reveal a lot of interesting information about each track. This is something you just don’t get with digital music. I loved being able to listen to each track for the first time whilst browsing Anders’ notes about what inspired him or the processes involved in creating a particular track. 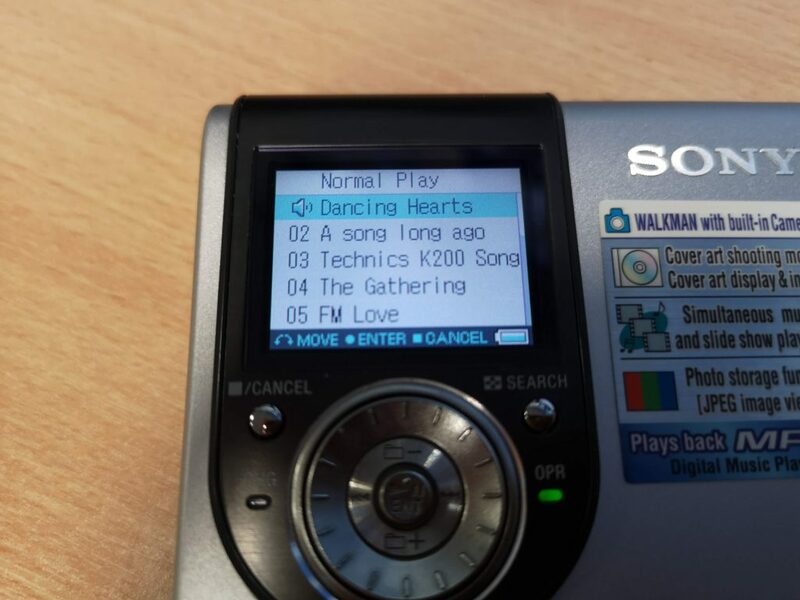 He’s certainly pulled out all the stops for the MiniDisc release, the artwork on the disc has been printed directly onto the case itself – no cheap stick-on labels here. This is certainly the only MiniDisc in my collection that has been printed this way and it looks amazing! The cassette release still looks good too, coming in a transparent green case with the album details printed on it in contrasting white. A lossless digital download of the whole album is included with both the Cassette and MiniDisc formats. Additionally the digital download includes an extra 16 bonus tracks not included on either the tape or disc releases. Alternatively, if you don’t mind missing out on the physical formats completely you can opt to just buy the album digitally if you prefer. Regardless of which format you choose, if you enjoyed either of his previous Retro Groove albums, or even Troubled Hearts then I pretty much guarantee that you will also enjoy this. Anders’ signature style of upbeat ‘cheerful’ sounding synth music mixed with occasional samples is present and correct. My personal standout favourite track has to be ‘FM Love’ closely followed by ‘Isabella’s Dream’ which features some lovely harmonised female vocal samples. There’s a couple of tracks with backing singers this time around that you may or may not enjoy depending on your taste. ‘Escape Your Fear’ sounds like it could have come straight from the Troubled Hearts album and I really enjoyed it. The other, entitled ‘Let’s Fly’, I didn’t like so much as the vocals are very processed and it just didn’t really click for me. It wasn’t bad enough that I’d want to skip it, but it’s definitely not something I’d want on repeat. 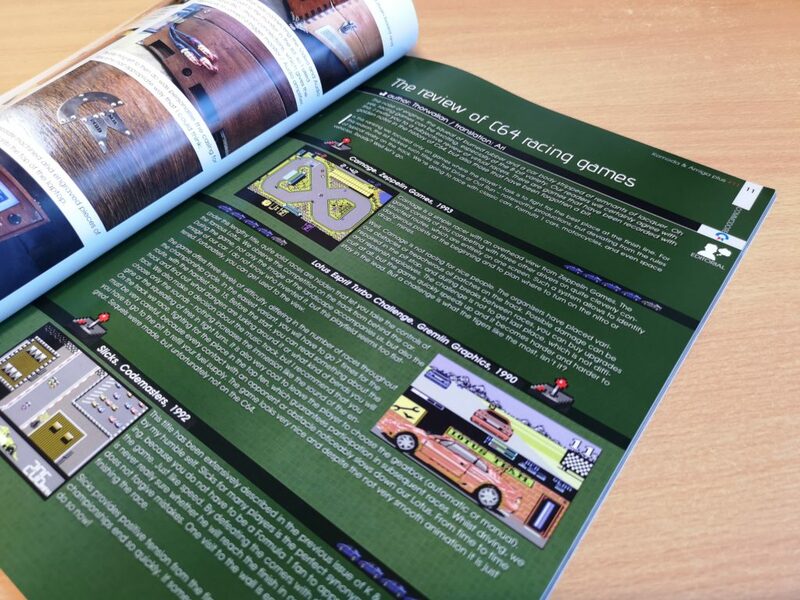 Anyway if you would like to get hold of a copy for yourself than head on over to EOX Studios website. Inside the box things got even better, it was literally crammed full of goodies. 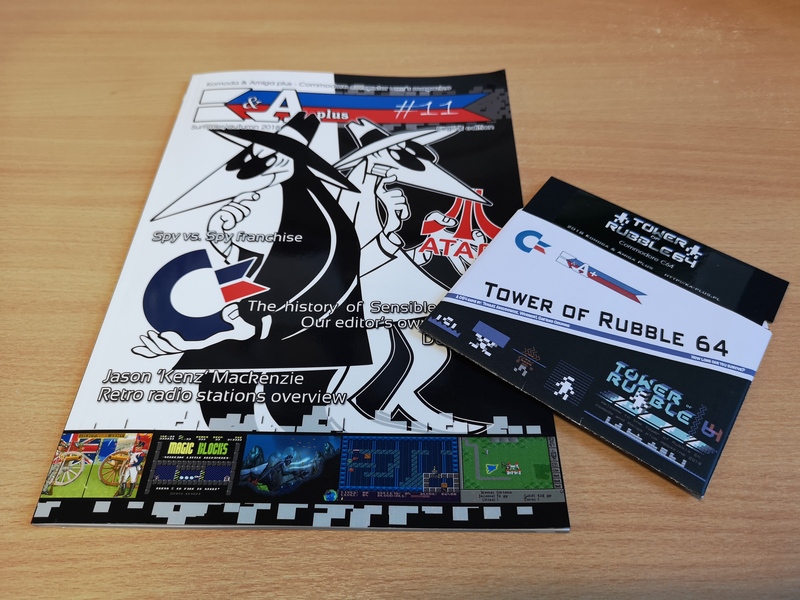 Box contents included the game on a 5.25″ floppy disk, a soundtrack CD, glossy full colour user manual, art postcard, key ring, loads of stickers, 2 pin badges, an A3 glossy art poster and a double sided A3 map of all the levels! There was also an unexpected, but much appreciated packet of Milky Way Magic Stars in there too. Needless to say it didn’t last long! 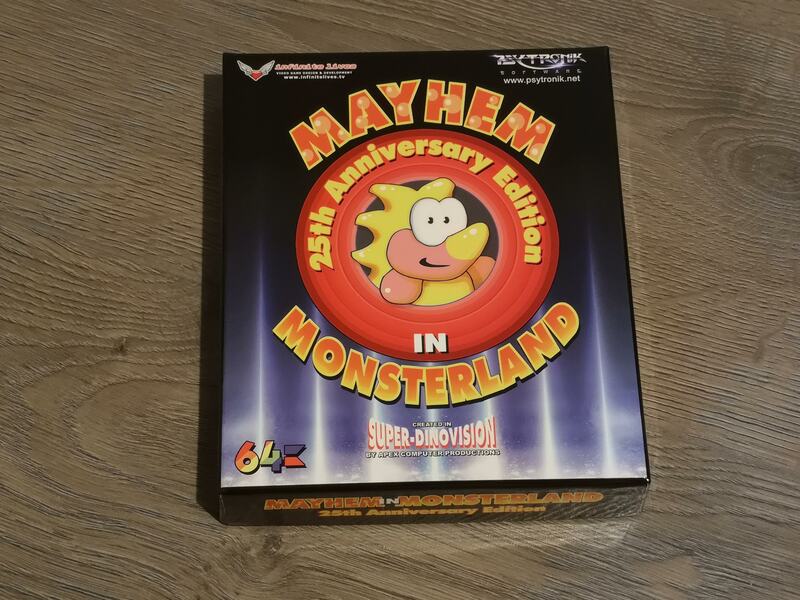 I’ve bought my fair share of special edition games over the years but for the money, Mayhem in Monsterland 25th Anniversary Collector’s Edition is definitely one of the finest in my collection. 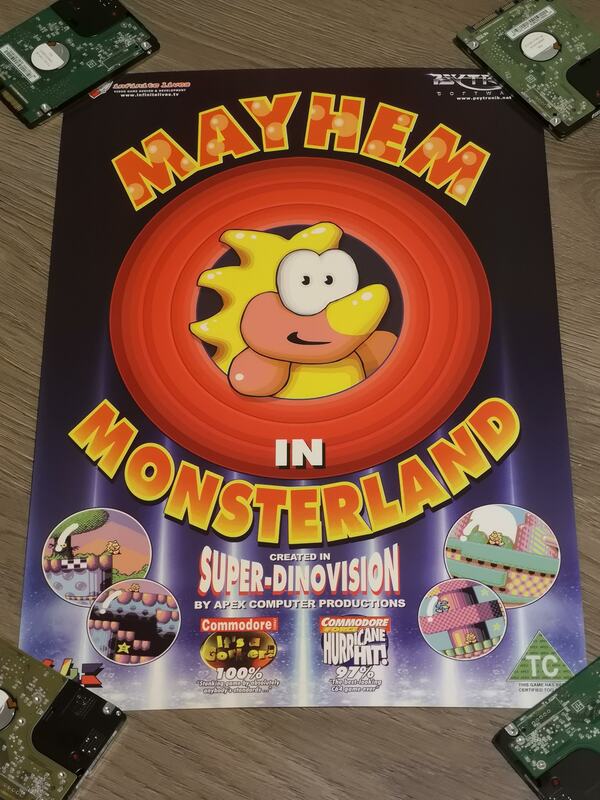 You can find out more about this release over at the Binary Zone Interactive Store. 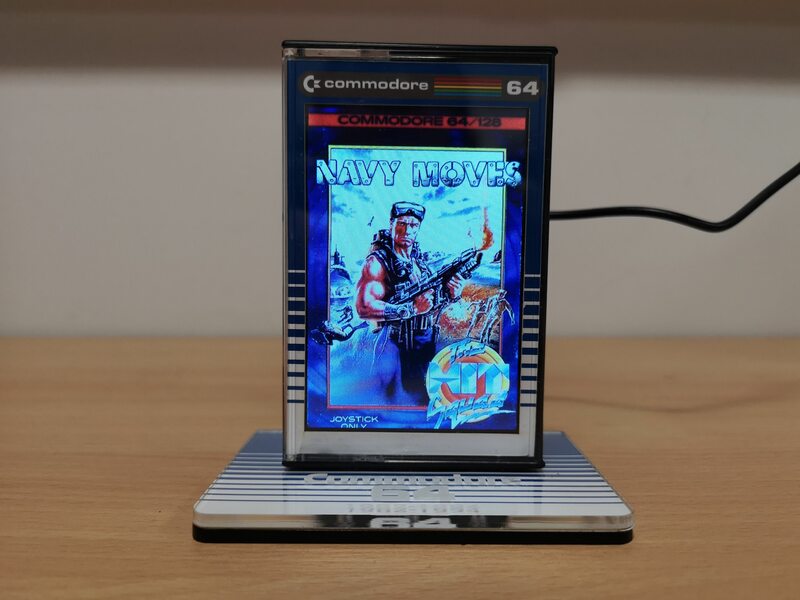 I saw this “C64 LCD Cassette Slideshow” whilst browsing through my twitter feed one night a few weeks ago. The moment it caught my eye I knew I had to have one for my man cave. Today it finally arrived and I’m over the moon with it so thought I’d share some photos and info about it. Slideshow in action – note the timings are greatly sped up in this GIF. It’s made from a real cassette tape box and has a 4″ LCD panel mounted inside, framed by a Commodore styled inlay. I’m not entirely sure what is driving the screen (and I’m not going to risk breaking it by opening it up) but I suspect it’s probably a Raspberry Pi. 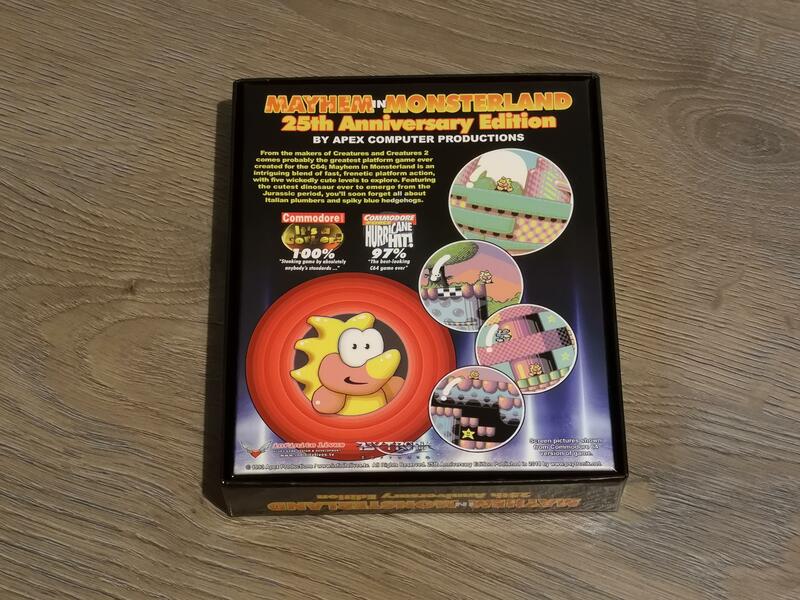 The slideshow comes ready to go with ‘over 2500 images of nostalgic games’ according to its’ creator. Each image is on display for around 5 seconds before moving onto the next automatically (my animated GIF has sped up the timings greatly). 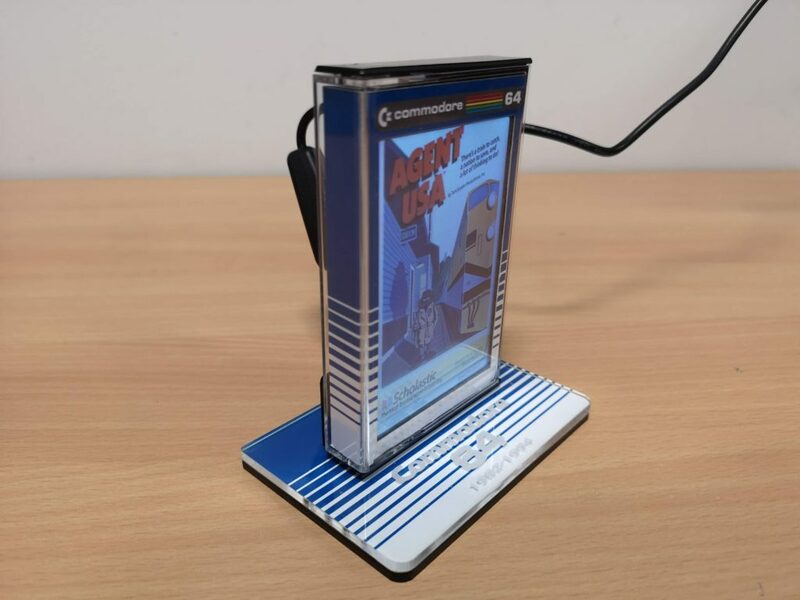 It’s mounted on a stylish Commodore themed perspex base that features the iconic Commodore blue and white stripes and the words ‘Commodore 64 1982-1994’. Around the back there is a decent length USB cable which provides power for the device. The cable is permanently attached and incorporates an inline power switch so it can be turned on and off without unplugging the cable which is a useful feature. 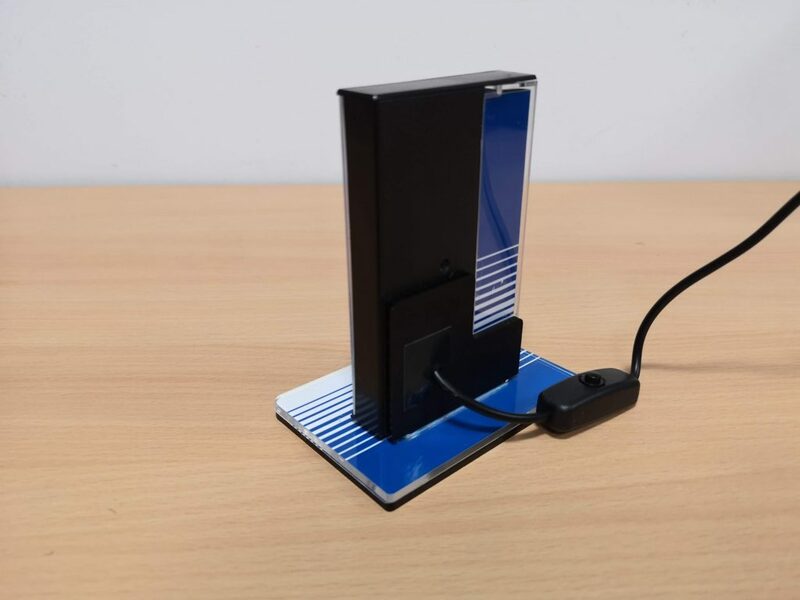 The C64 LCD Cassette Slideshow is completely hand crafted to order but has been completed to a high standard. It would have been nice to have access to some sort of timer facility to have it automatically turn on and off at preset times but that probably would have added to the complexity and cost. 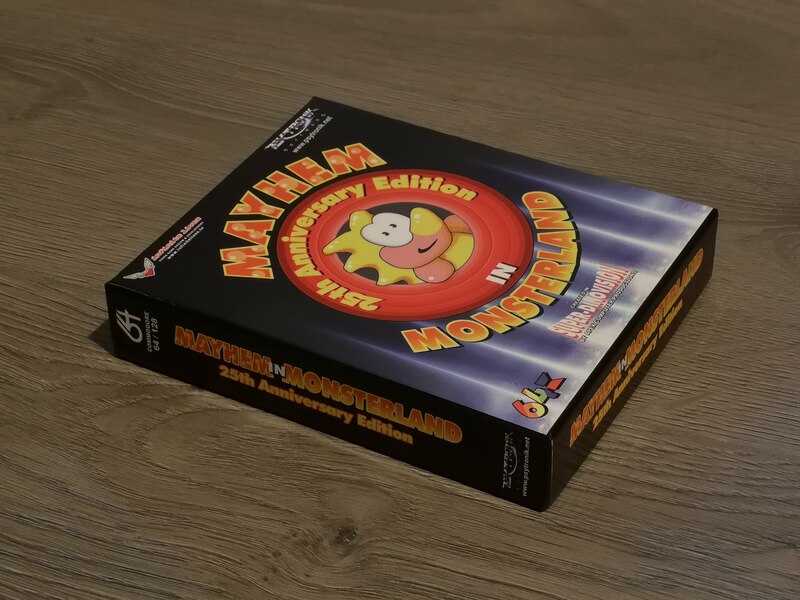 At £80 for the 4″ version including postage it’s not a cheap item but I think it’s a very fair price for what I received. There is a 3.5″ version that is £5 cheaper but don’t know why anyone would choose that over the larger screen for the sake of saving a measly £5. 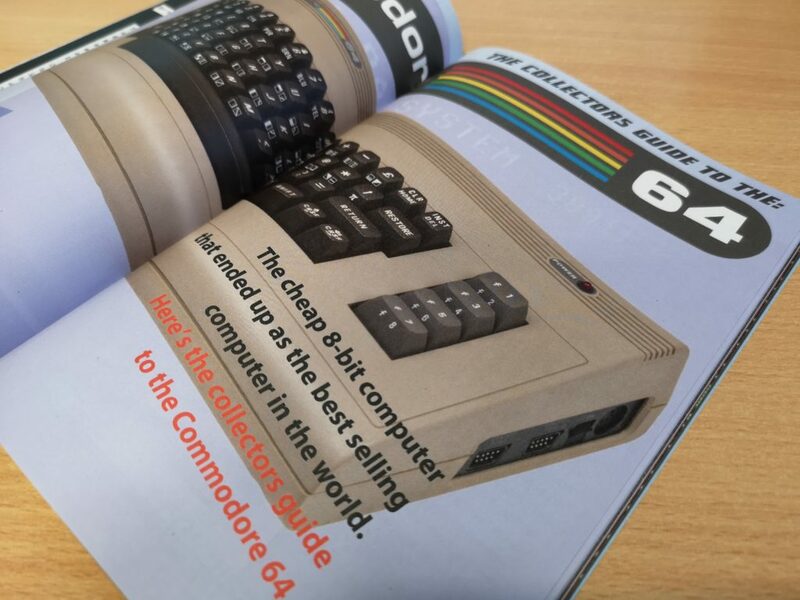 The seller makes these for other systems too, not just the Commodore 64. 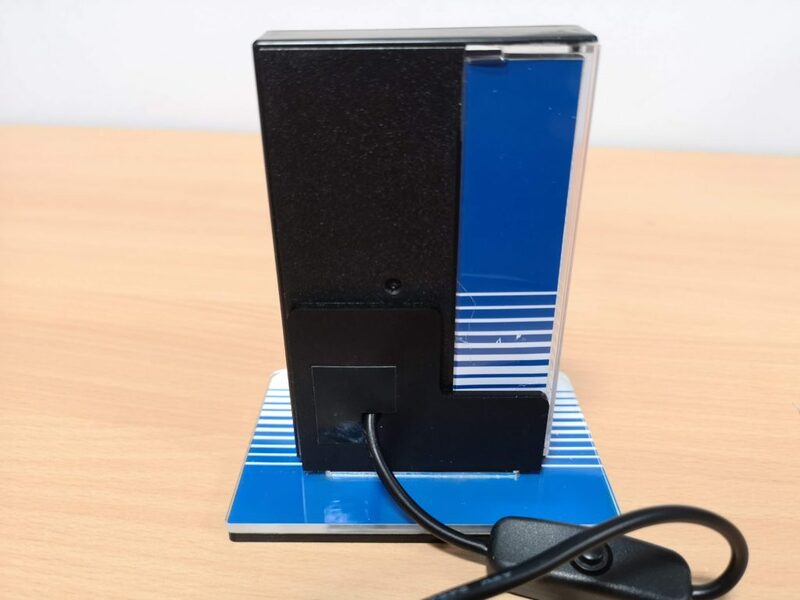 If you are curious and would like to know where to get hold of your own slideshow then you can visit the PlayRetroDesigns Etsy shop here. 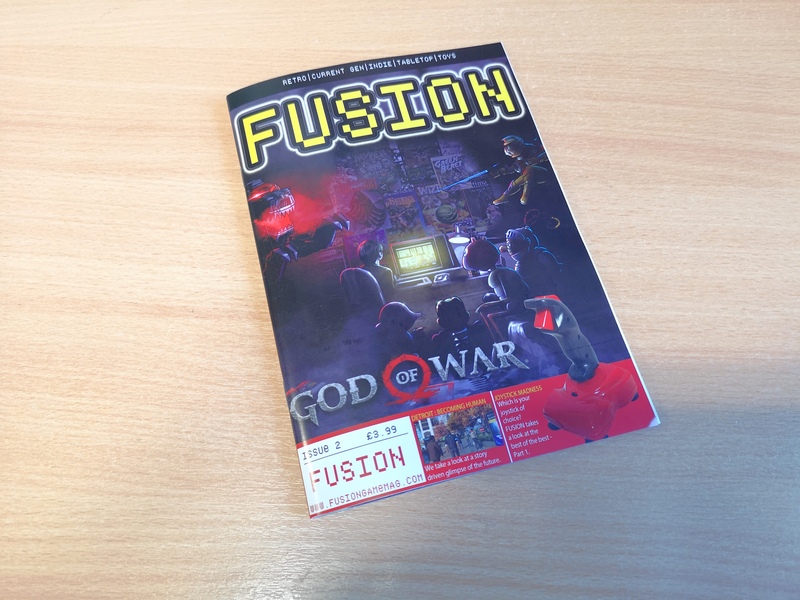 The latest issue of the relatively new retro/modern gaming mag, Fusion Issue 3 arrived this morning. Had a quick flick through and there’s lots of suitably ‘christmassy’ themed stuff in it to enjoy. The ‘Guide to gifts of Christmas past ‘ looked especially interesting. A great trip down memory lane for any kid that grew up during the 70’s and 80’s. 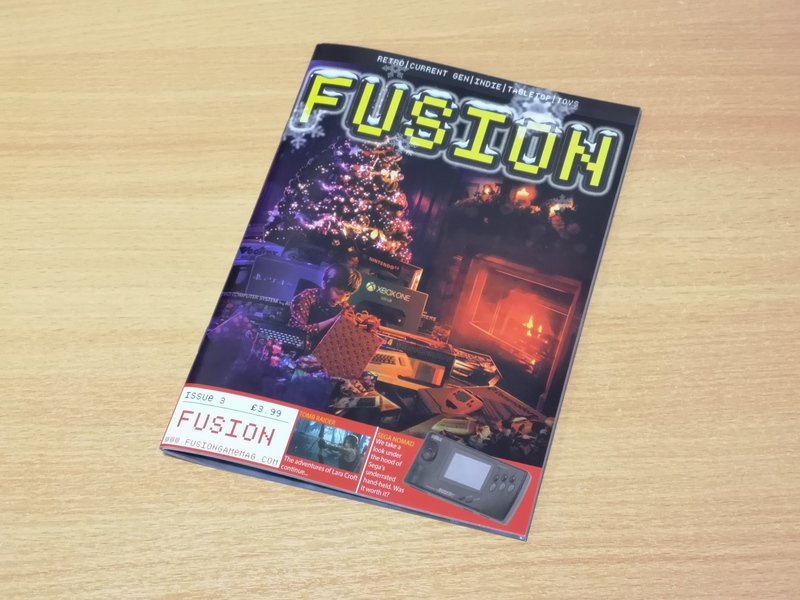 Plenty of other stuff too including a review of the new NeoGeo Mini, a look at some of the best games you can get for the PS Vita and loads more. Definitely looking forward to reading it over the weekend in front of the fire! 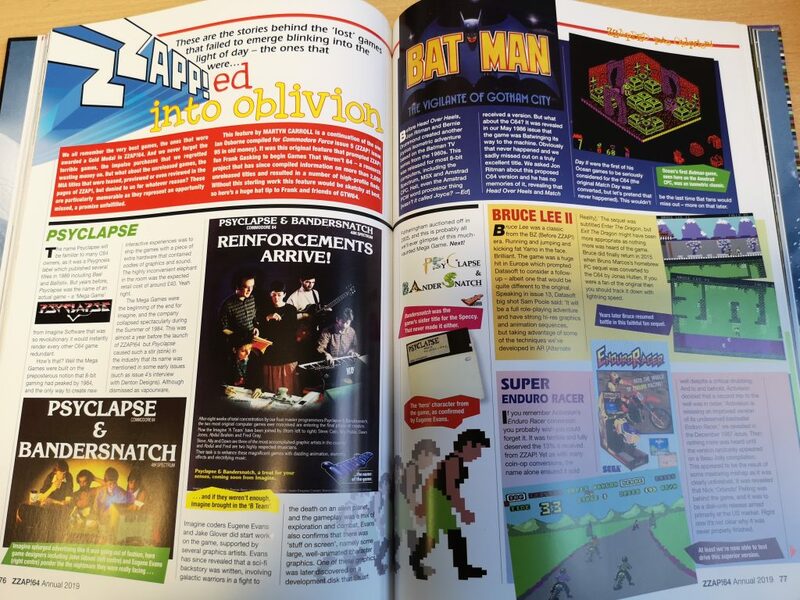 The latest Freeze64 Issue 23 dropped through my letterbox yesterday. This one features a photo of the late Ben Daglish on the cover rather than the pixel game art that I’ve become so accustomed to. 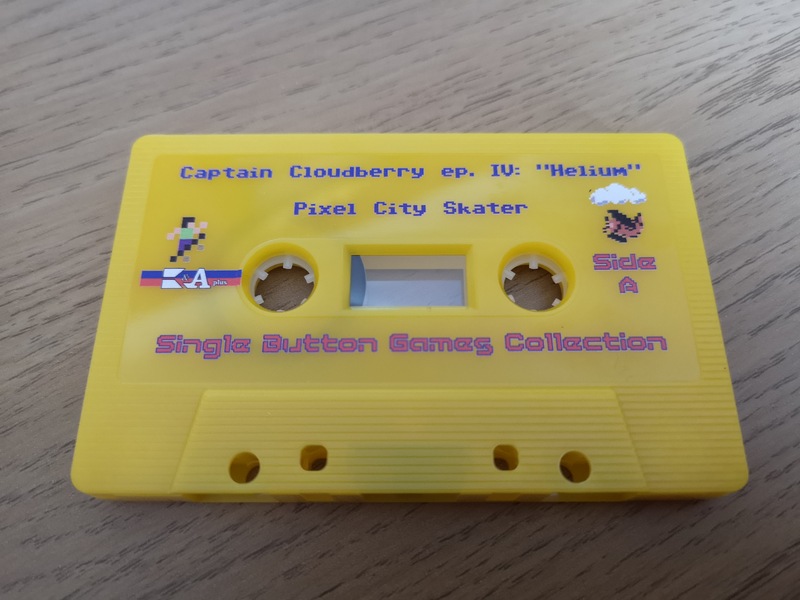 In case you are not aware he was a legend in the C64 music scene and composed some amazing music for many great games including The Last Ninja. 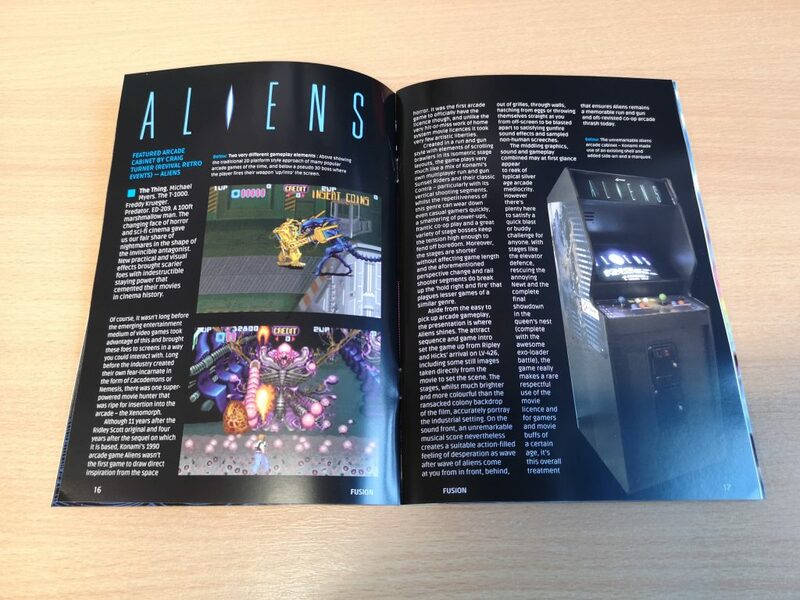 As always there’s plenty to read inside including my personal favourite, a ‘Talkies’ article looking at games that featured speech. I always used to love games with speech – it was just so cool to hear your 64 talk, no matter how scratchy or poor quality it may have been. The fact that they were able to do this with just a few kilobytes of memory still amazes me to this day! 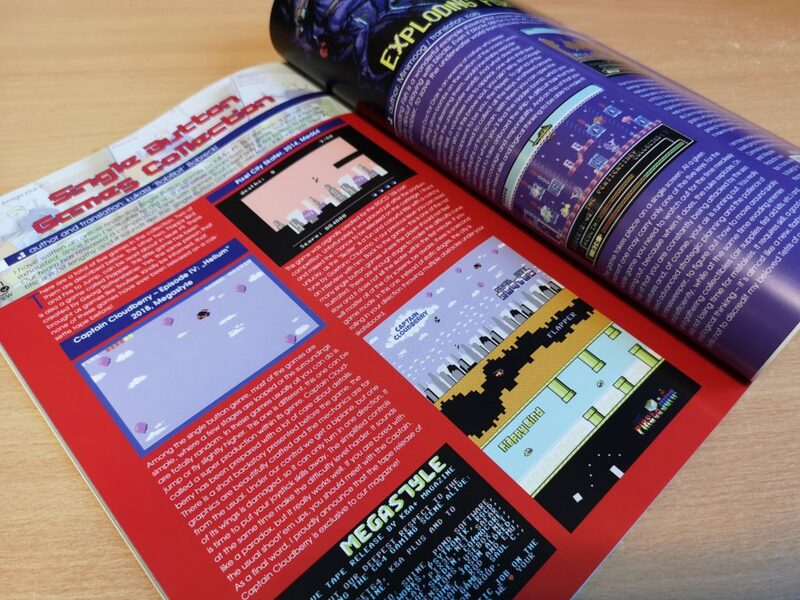 Most of the regular features make a welcome return including Zzapback and a look at new and upcoming games in the Commodore 64 scene. This fanzine/magazine continues to go from strength to strength and really deserves your support. 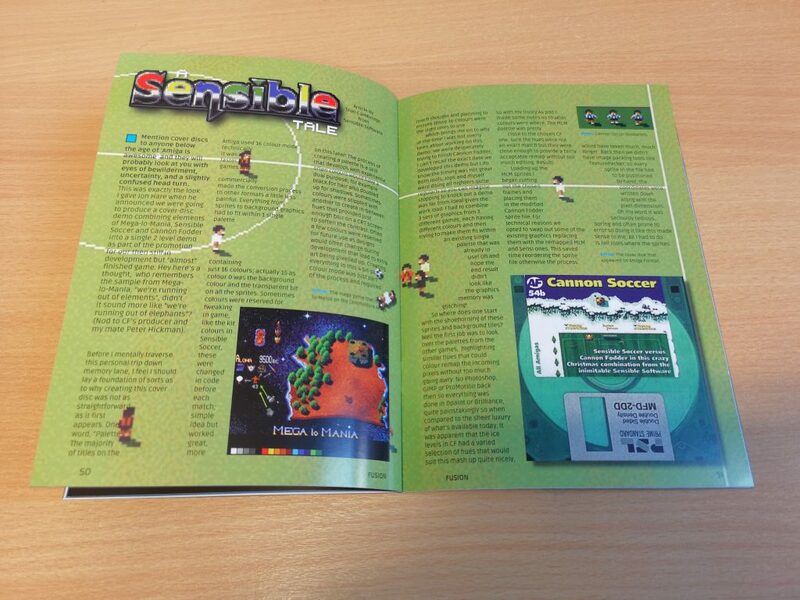 If you would like to get hold of your very own copy of Freeze64 Issue 23 then take a look here. 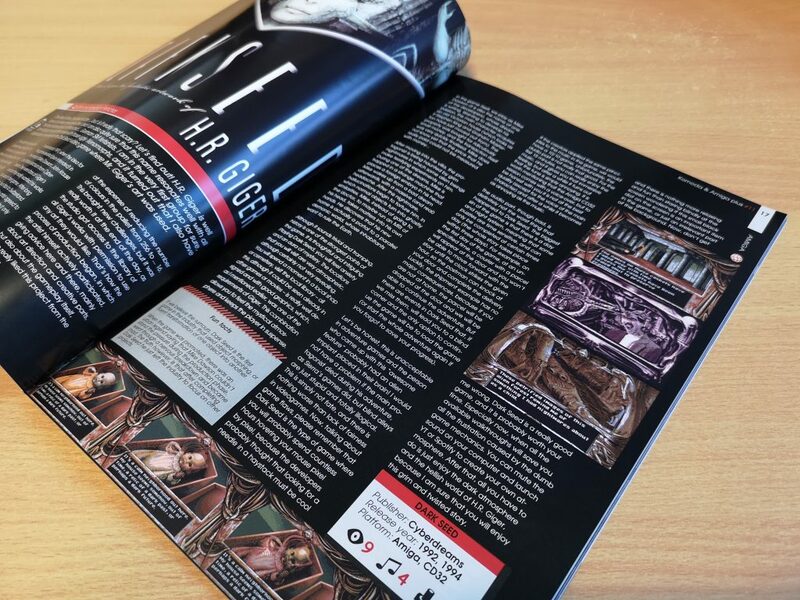 This magazine is only published a couple of times a year but is always packed with great content and K&A Plus Issue 11 is no exception. 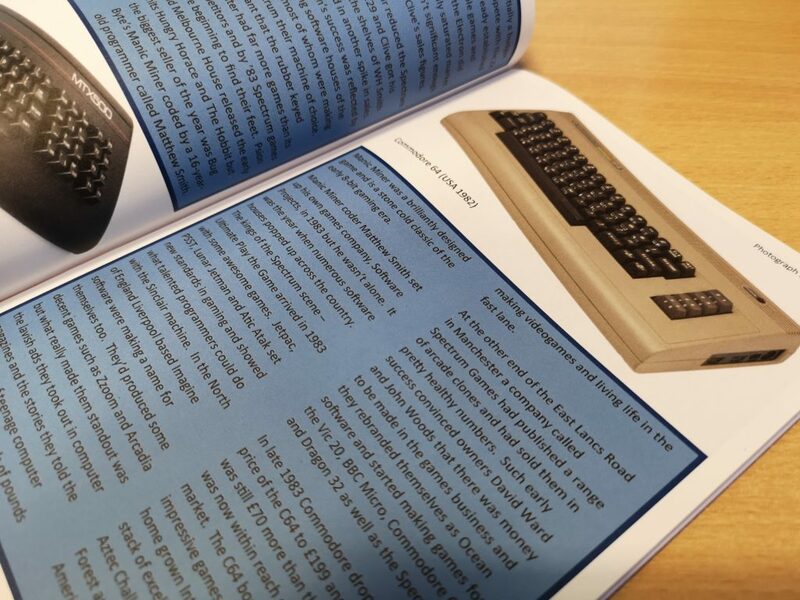 This is probably the biggest magazine both in terms of thickness and content there is for the Commodore range of machines in 2018, packing in a whopping 81 pages and none of them are filled by adverts! 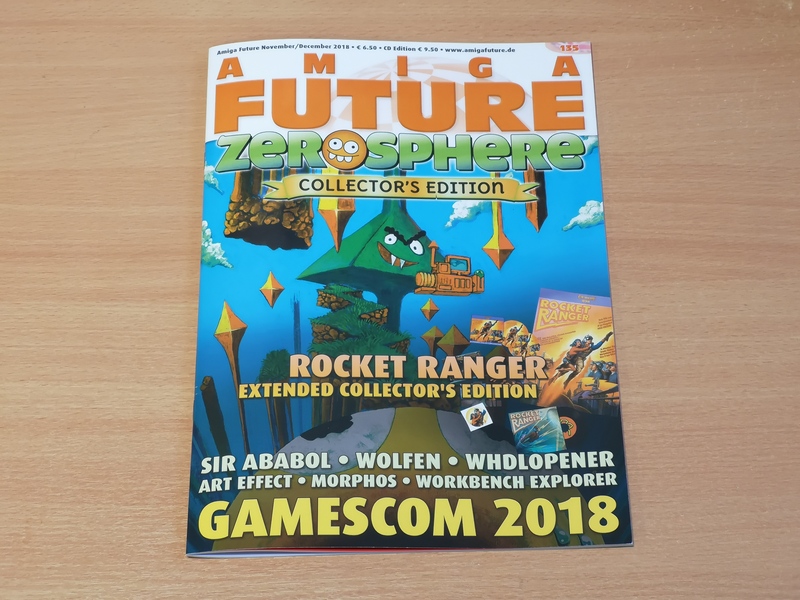 This issue has a fairly even split of content between the Commodore 64 and Amiga computers which is fantastic for me as I actively support both formats. 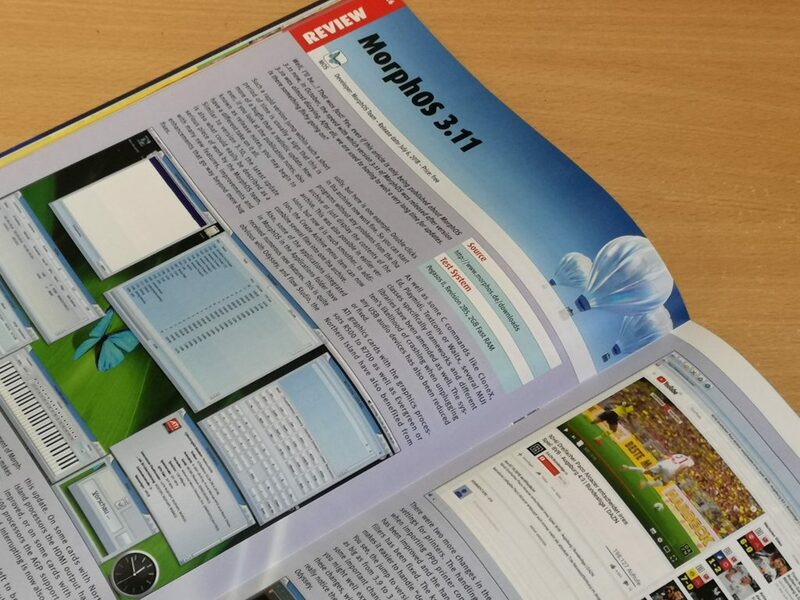 There’s news, reviews, tutorials and retrospective articles covering both machines and even some stuff for the Vic 20 and the post Amiga MorphOS and AROS systems. 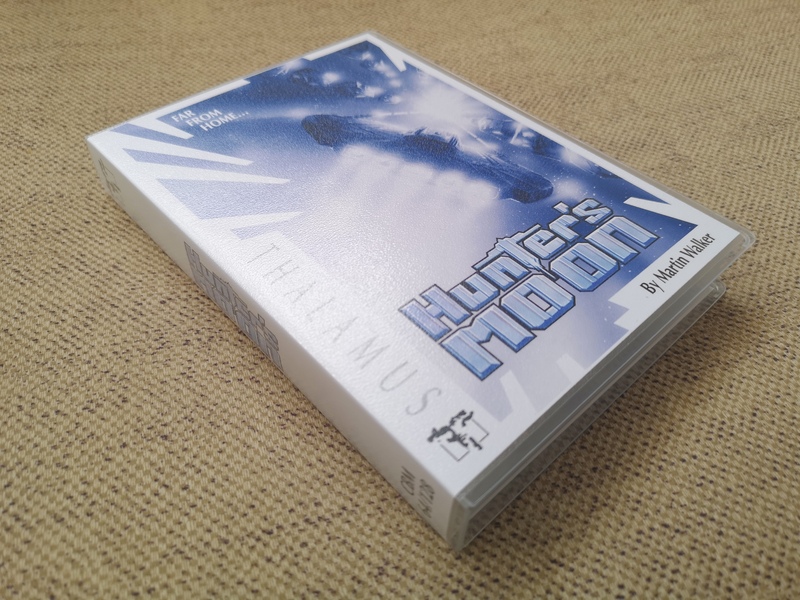 Mini reviews of C64 Racing Games. 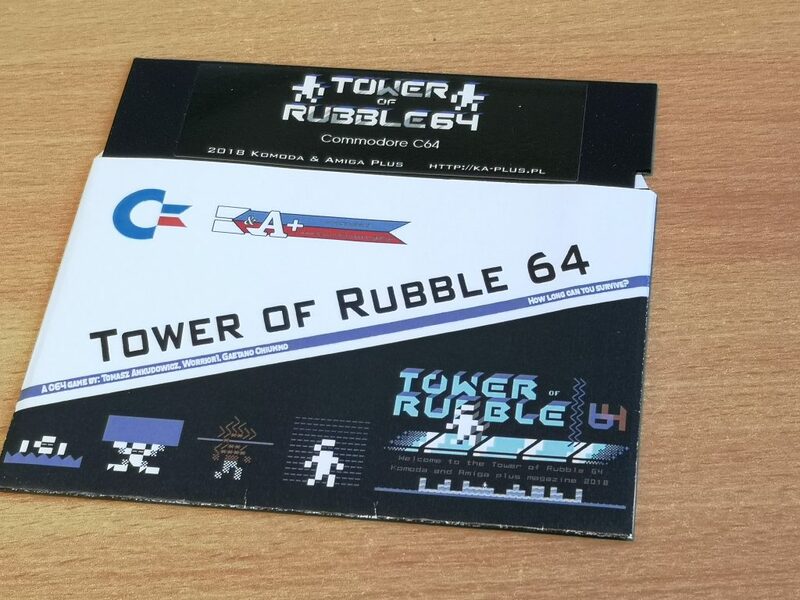 The star of the whole issue for me is the included (if you pay a little extra for it) 5.25″ Coverdisk featuring a brand new game for the Commodore 64 – ‘Tower of Rubble’. This is the first 5.25″ Coverdisk I have seen since Commodore Disk User ceased publication back in 1991. 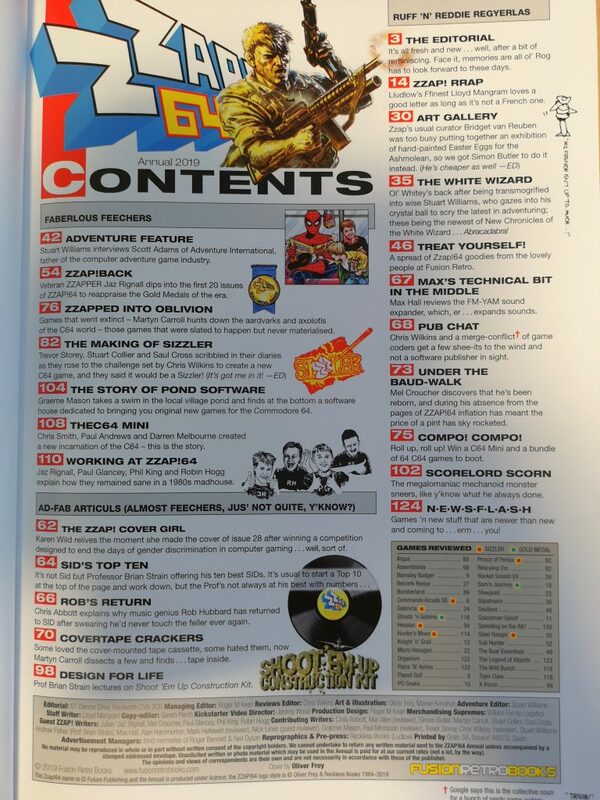 There’s loads of content, far too much to list but some of the highlights for me are: A look into the Spy vs Spy franchise, H. R. Giger’s Dark Seed, reviews of ‘Retro Radio Stations’, an article about the pro’s and cons of modifying/upgrading retro machines and an ‘Amiga in your pocket’ tutorial showing you step by step how to convert a windows tablet into a portable Amiga!!! 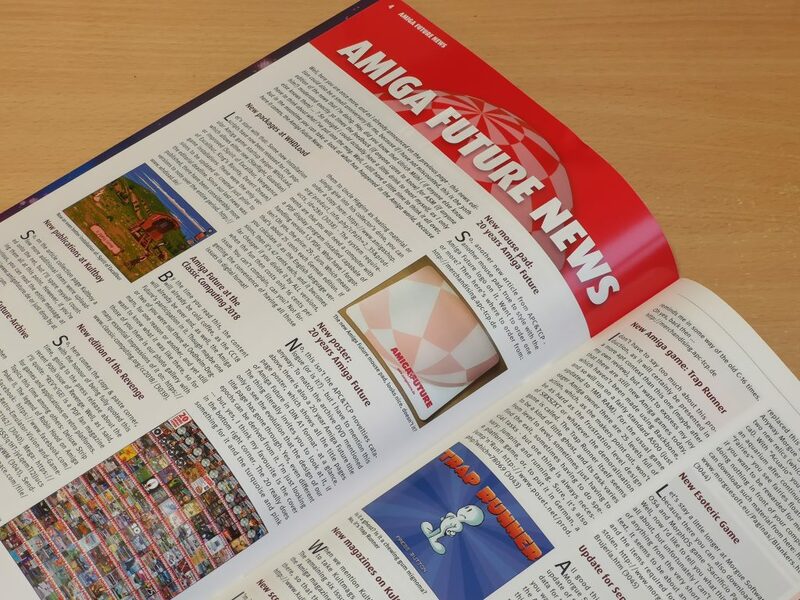 If you want to find out more, or order yourself a copy, head on over to the Komoda & Amiga Plus website. 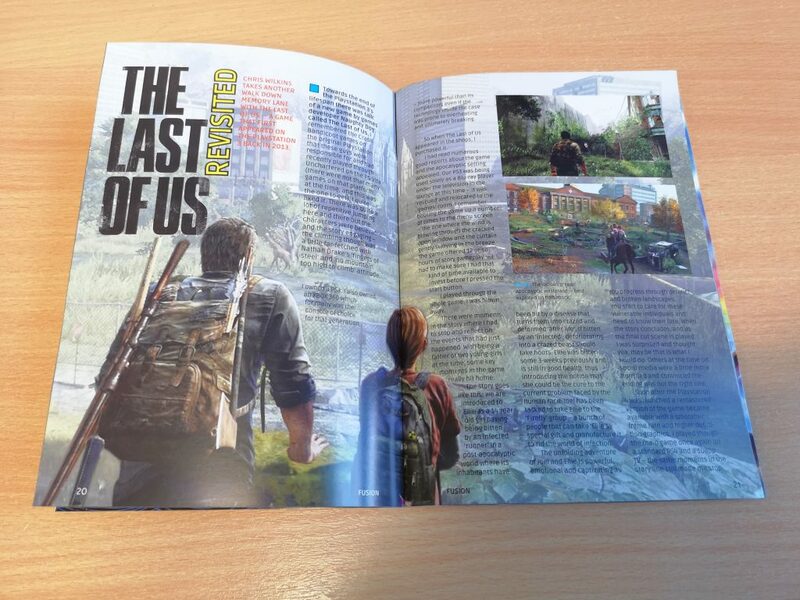 The magazine is produced in Poland and shipping to the UK only takes a few days. 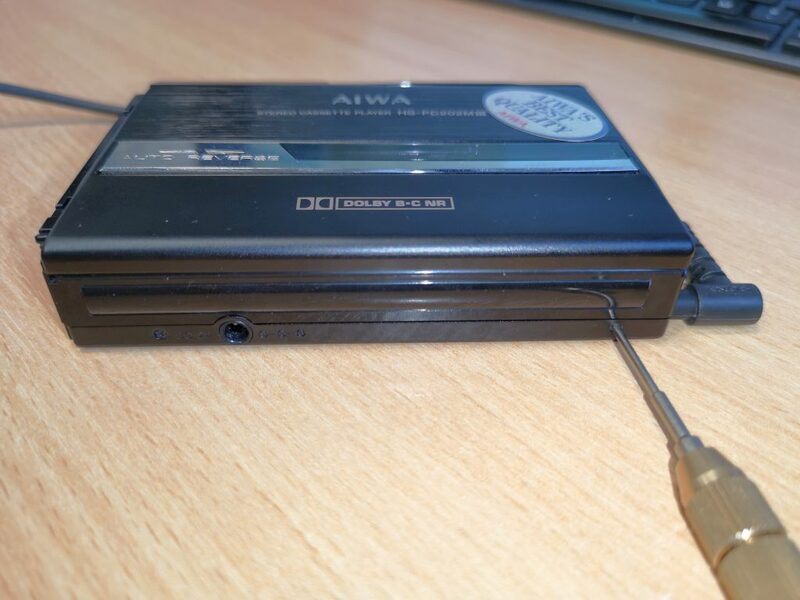 I recently bought a ‘New Old Stock’ AIWA HS-PC202 Mk 3 Personal Stereo off eBay as I just couldn’t resist the idea of unboxing a ‘new’ walkman in 2018. Now I’m fully aware that you can buy brand new ones off Amazon but these are pretty cheap and nasty affairs designed to cash in on nostalgia rather than offer a quality audio experience. 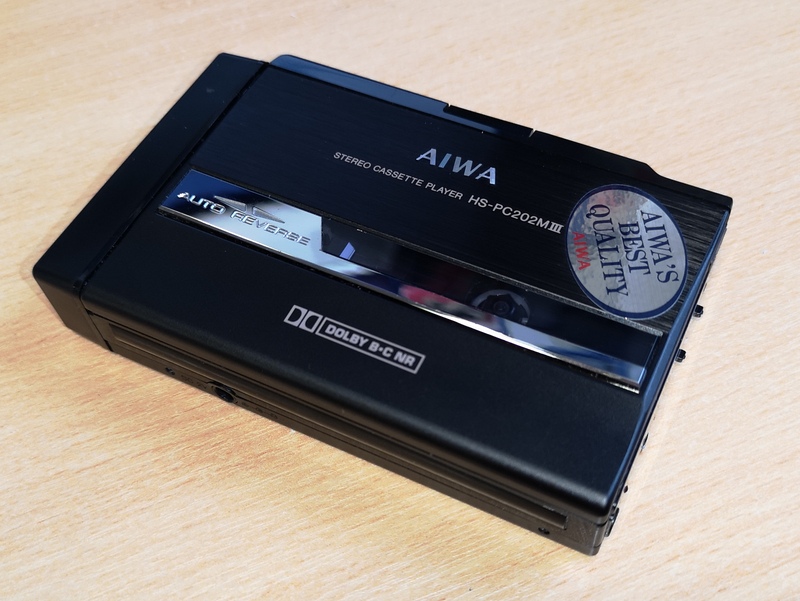 This Aiwa model is a quality bit of kit with the ability to play Chrome tapes, Dolby B & C noise reduction, auto-reverse and a super slim, attractive design. However it had been sat in storage for about 25 years so when I popped in some batteries and tried to play a tape – nothing happened! I could see the power LED light and hear a hiss from the headphones but the spindles didn’t turn. Thankfully I could hear the motor run momentarily if I held the unit to my ear whilst pressing ‘play’. 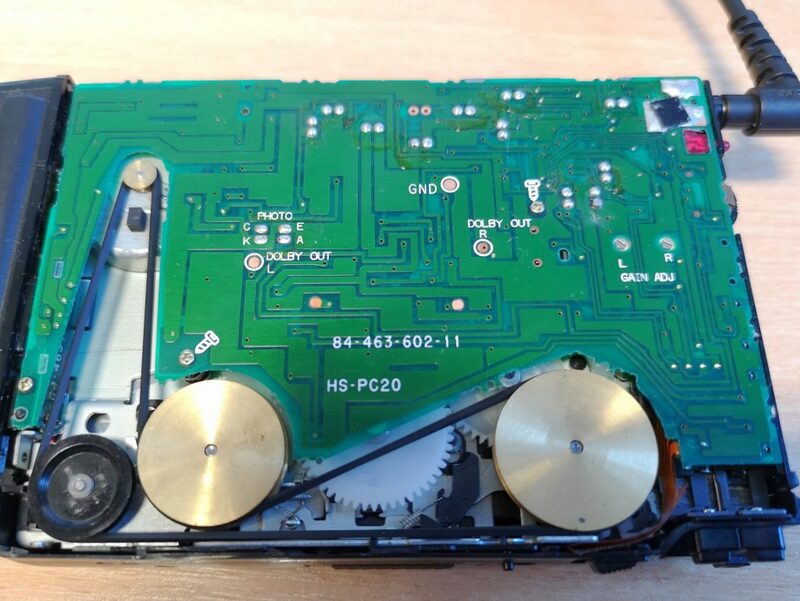 This was a sure sign that the belt had failed in some way which is very common on vintage cassette decks. 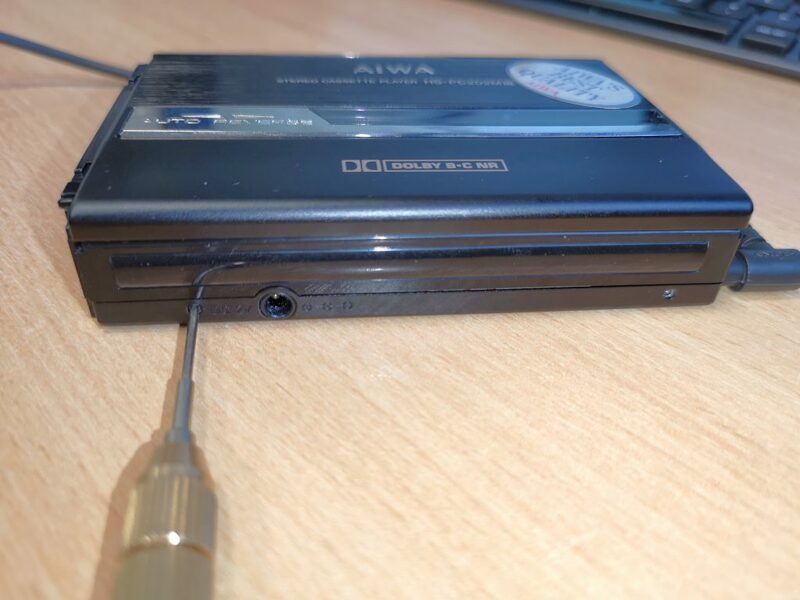 This post will provide instructions on how to open up the AIWA HS-PC202 Mk 3 cassette player, and replace the belt. The only tools you need are some small watch-makers screwdrivers and a pair of tweezers. It’s quite a straightforward job as the player has been designed with the foresight that one day someone would need to change that belt! 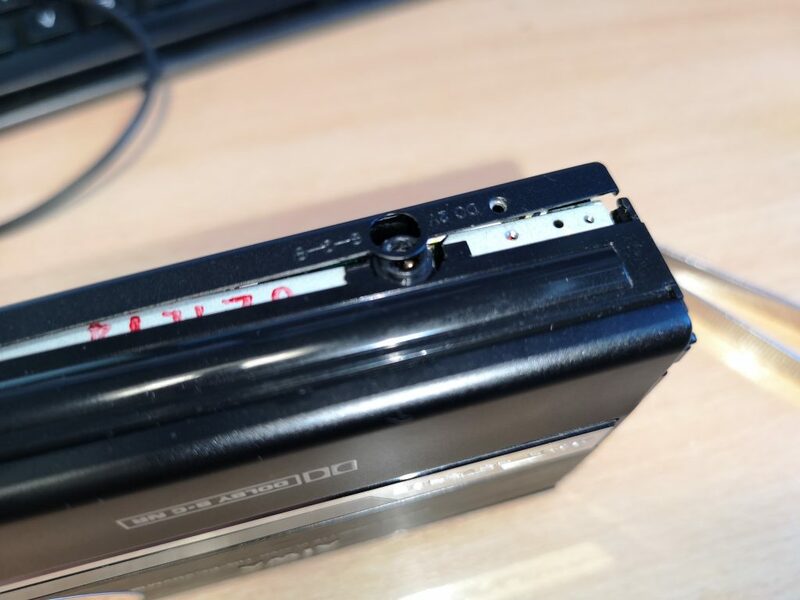 The first thing you need to do is unclip the battery compartment as one of the screws you need to remove is hiding behind this. 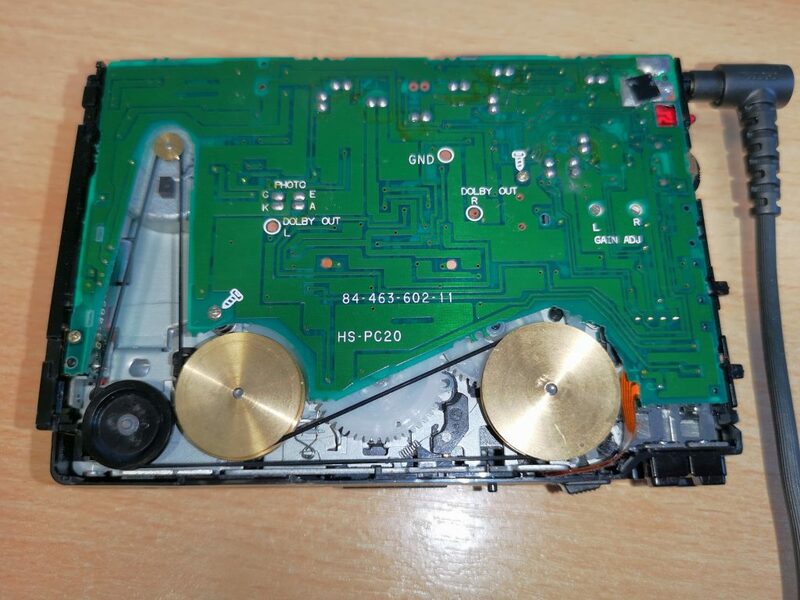 Now you need to remove the backplate from the player to expose the belt. It is held in place by 3 tiny screws and a clip that fits inside the case near the play button. Take your philips screwdriver and remove the first screw shown in the picture below. Place it in safe place, preferably in a small container as the screw is incredibly small and easy to lose. This is a slightly different size to the next two so it should be easy to identify when you are putting things back together. Now spin the player around so you are looking at the side where the lid hinges and remove the two screws indicated in the photos below. Store these two screws safely with the other and put aside as you are ready to begin removing the backplate now. You need to be careful and not rush this next part as there are a few things that are held in place by the backplate and they will fall out and get lost if you’re not careful. The one thing seems to fall out no matter what you do is a small, circular, black plastic spacer that fits between the backplate and the DC power socket. Now you know about it, be prepared for this and catch it. 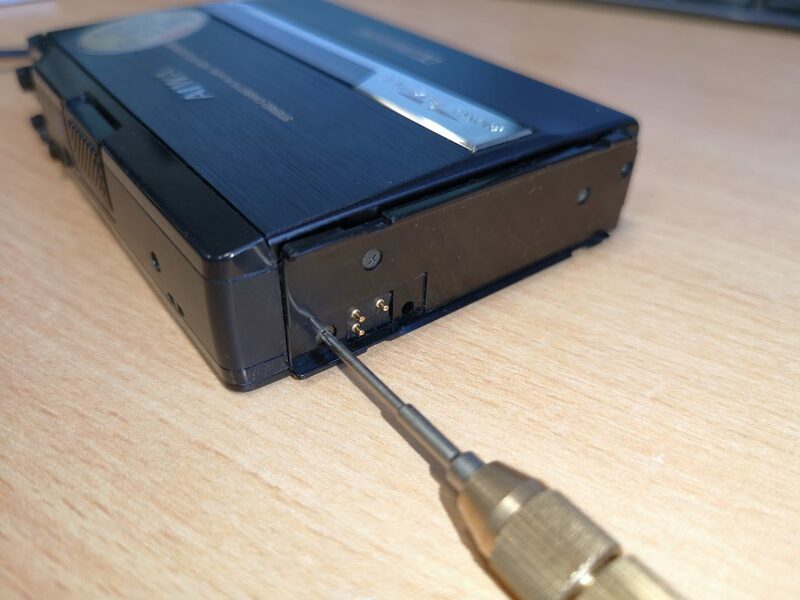 Store it safely with the other screws. The other things held in place by the backplate are the Dolby NR and Tape Bias selector slide switches. It’s simple to put them back if they fall out – but if you’re not expecting them to drop out they could easily fall on the floor un-noticed and get lost. This is the small plastic part that will fall out from around the DC power socket. These are the Bias and Dolby selector switches that may drop out when you remove the backplate. The backplate needs to pivot away from the case from the battery end first. There is a lip at the opposite end by the volume wheel and switches so you need to picture it hinging from that position and focus your efforts on making it open that way. If you place the player vertically it’s easier to do this and it will prevent the switches from falling out. As you can see in the above photo there is a small metal tab on the front edge of the backplate that fits into a plastic lug inside the case, above the play button. 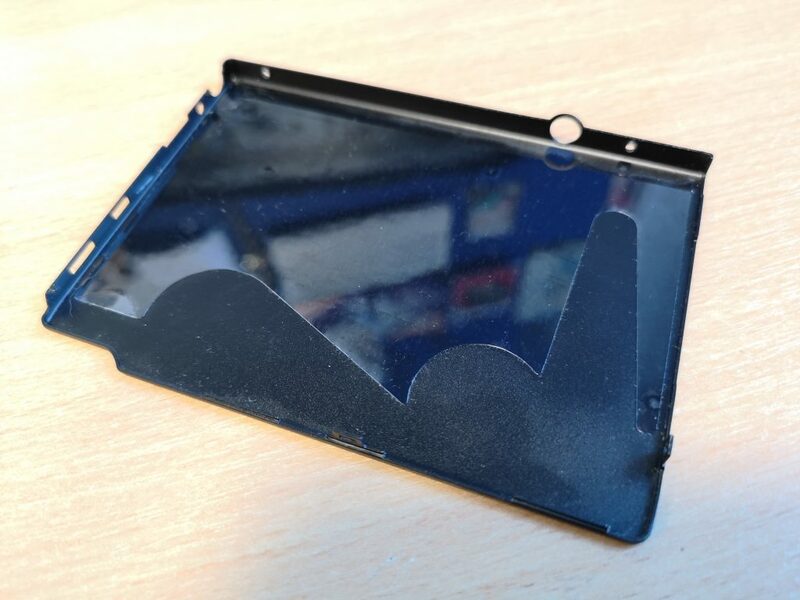 You will need to carefully slide a small flat bladed screwdriver in and gently lever the plastic around the play button outward, away from the backplate to release the tab. The backplate should now be free and you can pull it away from the body and slide it upward to remove it, leaving the switches on the top in place. The backplate – note screw holes and cut-outs for controls and DC input. 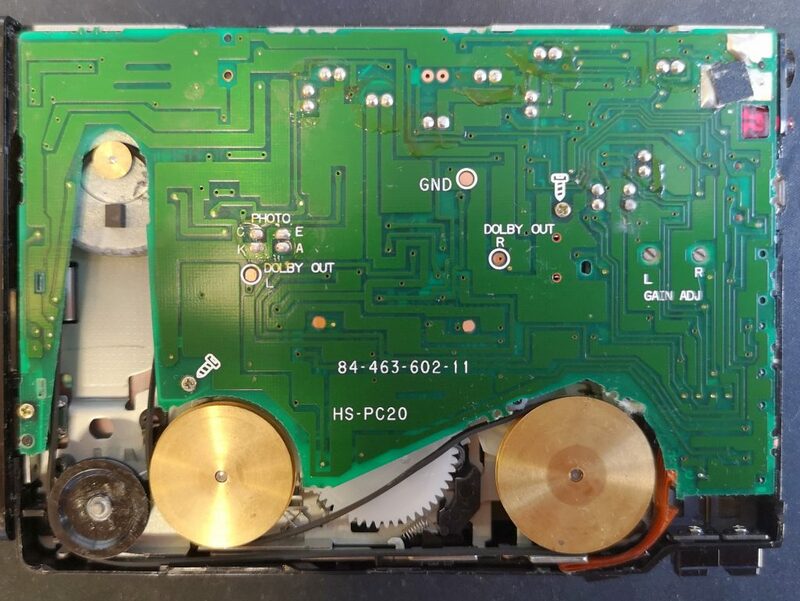 Now that the backplate if off you should see be able to see the circuit board with a cut-out for the belt and pulley wheels just like in the photo below. A belt in good condition should be taught and fit around all the pulleys tightly, something that mine was definitely not doing! The smallest wheel is the motor pulley, the two large brass wheels drive the capstans and I think the smaller black wheel is there just to guide the belt around the others. It took quite a lot of investigative work to locate a new belt that was an exact match for the original. 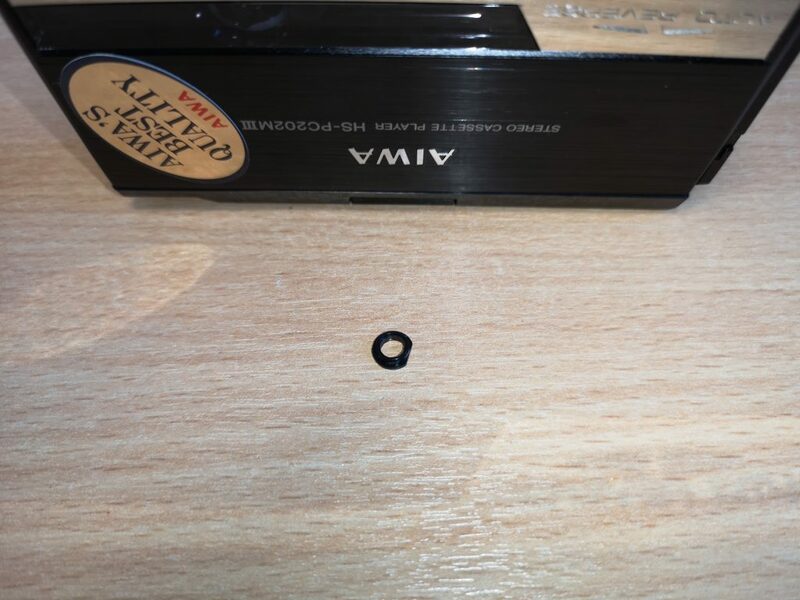 Avoid those cheap multi-packs you can pick up off Amazon and eBay from China – the quality of them is variable at best and the chances of getting one that actually fits correctly is next to zero. 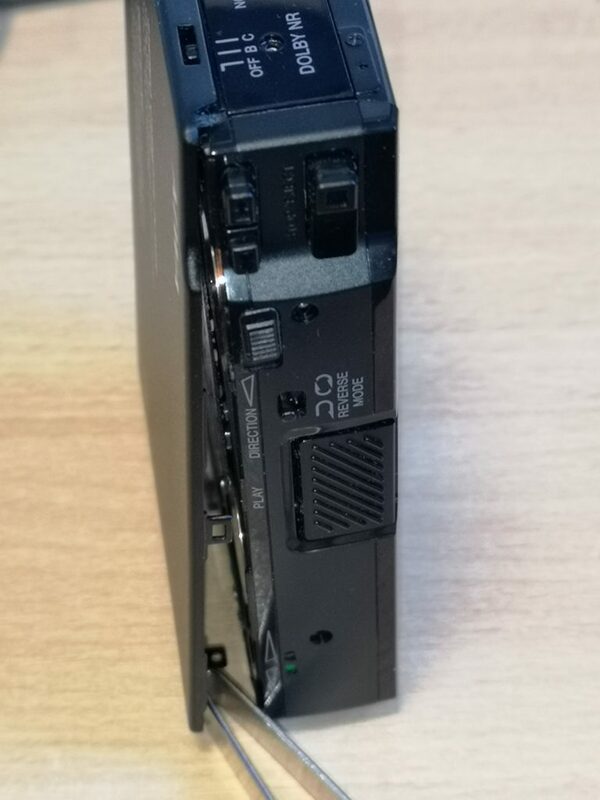 The belt fitted to this walkman has a square cross-section, not round or flat like many other belts. 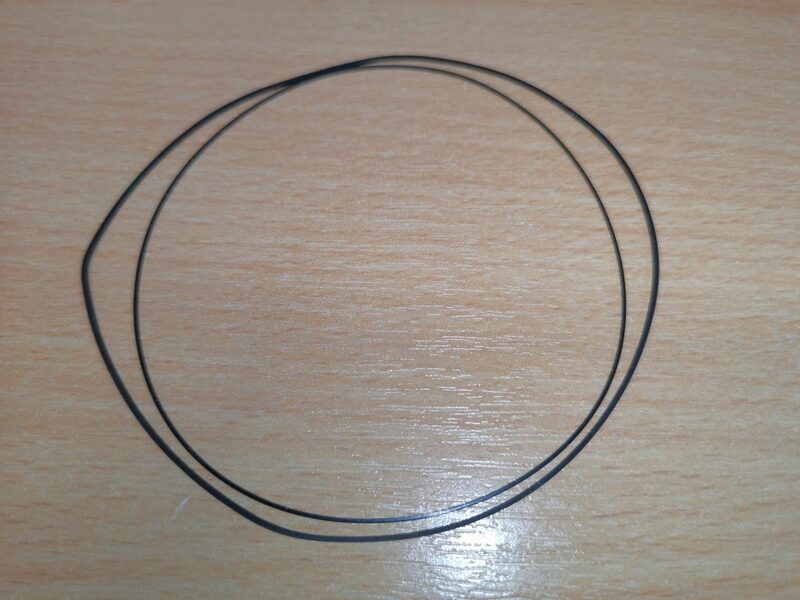 It is also very thin – about 0.6mm thick. The length is 76mm. For belts most suppliers use the measurement of the diameter of the belt when laid out flat in a circle. So basically you need to find a 0.6mm x 76mm belt. I couldn’t find one this thin at first so I bought a 1mm x 76mm belt. It did fit and work but was quite a tight fit around the black wheel where it nearly touches the side of the case. It was also only a fraction of a mm away from touching itself (ooerr) where it passes beneath the nearby brass pulley (see the photo below to see how tight it was). The company I bought the belt from (SignalsUK) was super helpful and based in the UK too. The belt arrived a couple of days after ordering. Although it was thicker than the original it did appear to work OK so I will include a direct link to it here. They supply hundreds of different belts and electronic spares so they’re a handy company to have bookmarked. The belt is very easy to fit. Use your tweezers to place it around the motor spindle and around the other pulleys following the path in the photo below. There is a small plastic tab that protrudes out of the case towards the black plastic wheel. The gap it leaves is very small (you will find it at around the 8 o’clock position) so be careful not to snag or damage the belt here. There will be a a degree of tension in the belt and this is normal so you will need to stretch it a little over the final wheel. The 1mm thick belt – notice how it is practically rubbing against itself where it passes back beneath the left-hand brass pulley wheel. If a jobs worth doing, it’s worth doing properly – so I continued my search for a better fitting belt. Eventually I stumbled upon a place that custom manufactures belts for a variety of machines, including the AIWA HS-PC202 Mk3. The Mk3 is apparently mechanically identical inside to the Mk2 and so the belt they supply for the Mk2 also fits the Mk3. Here’s a link straight to the correct belt – here. 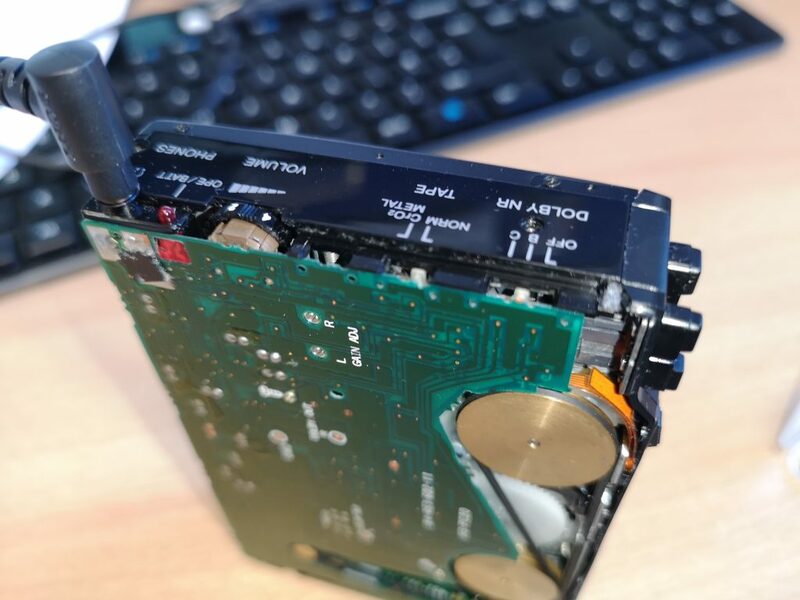 The company, FixYourAudio, is based in Slovakia and is run by a very helpful guy who makes the spare parts purely as a hobby to help enthusiasts keep these old machines alive. A week or so after ordering my belt arrived in the UK so I have no qualms in recommending them. It is ever-so-slightly thinner than the original but is definitely a better fit than the 1mm thick one. Comparison between the old stretched and worn belt on the outside and the new one on the inside! 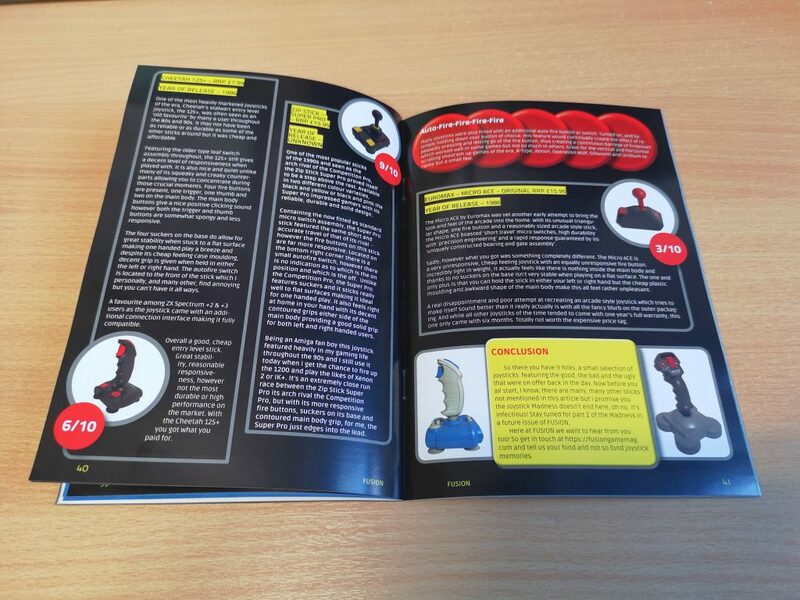 Before you finish off – if you have any additional problems with your player such as unwanted ‘scratchy’ noises when turning the volume wheel or when the headphone jack is twisted in the socket then take advantage of the opportunity and squirt some DeoxIT on them whilst you’ve got the player open. Don’t forget to operate the volume wheel fully a dozen or so times to work the fluid into the pot and clean it up. Likewise for the headphone socket, squirt some in and then insert the plug and twist it around in circles a bunch of times to clean off the contacts. Now you just need to put it all back together. If you knocked off the slider switches then pop them back on now. 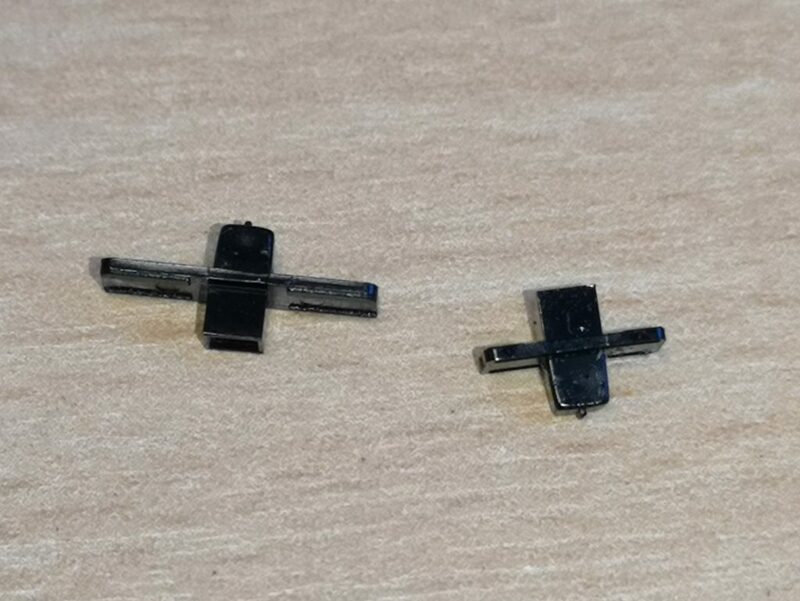 You will notice that one side of them is hollow and this will sit on top of the appropriate switch sticking out from the circuit board. The larger of the two fits on the Dolby NR slider whilst the other belongs on the Tape Bias switch. Don’t forget to place the little round spacer back over the DC input port. There is a little flat spot on one side of the circle and this should be positioned facing the outside of the case so that it fits flush against the flat edge of the backplate. You may need to press and squeeze gently in a few places, particularly around the play button to get the tab to engage in the lug correctly. However you should not have to force anything. If you feel any resistance stop and check, reposition the backplate, check the spacer and/or the position of the slide switches and try again. Once it has popped back into place and you are happy with the fit all around, replace the 3 screws and you should be good to go! Enjoy the new lease of life your personal stereo has been given! The small plastic spacer fits here. Flat edge towards the backplate. If you found this guide useful then please leave a comment below, it would mean a lot to me. Likewise if you have any questions I’ll do my best to help. 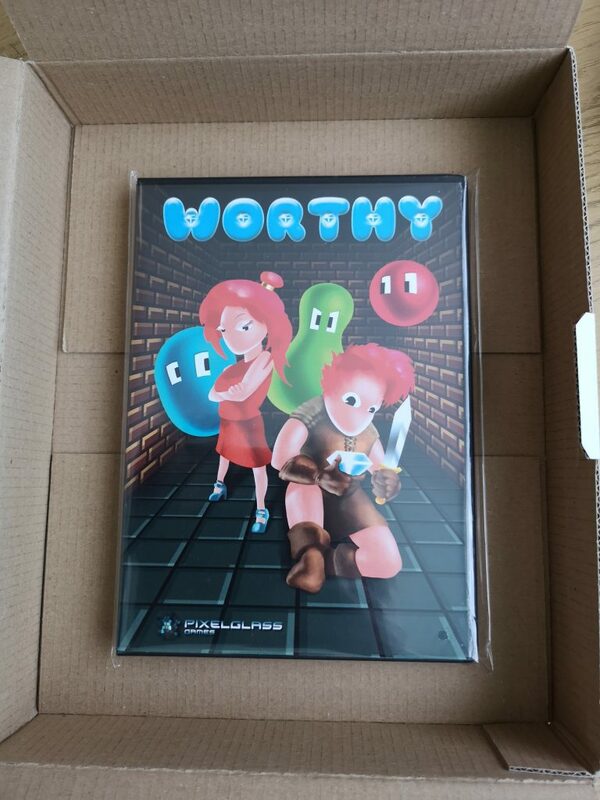 It certainly took quite a while for Worthy to arrive, at least in physical form, but it was well worth the wait. 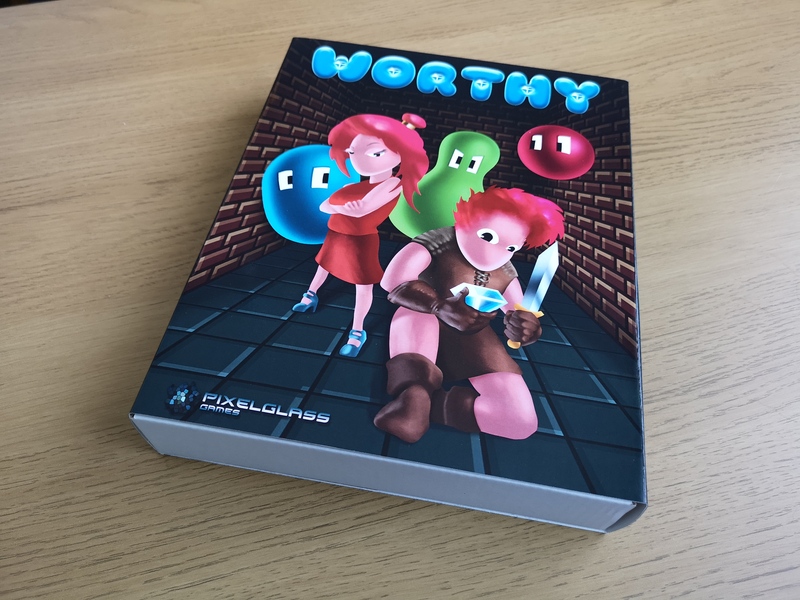 This is the first new (physical) Amiga game I’ve bought in about 25 years! 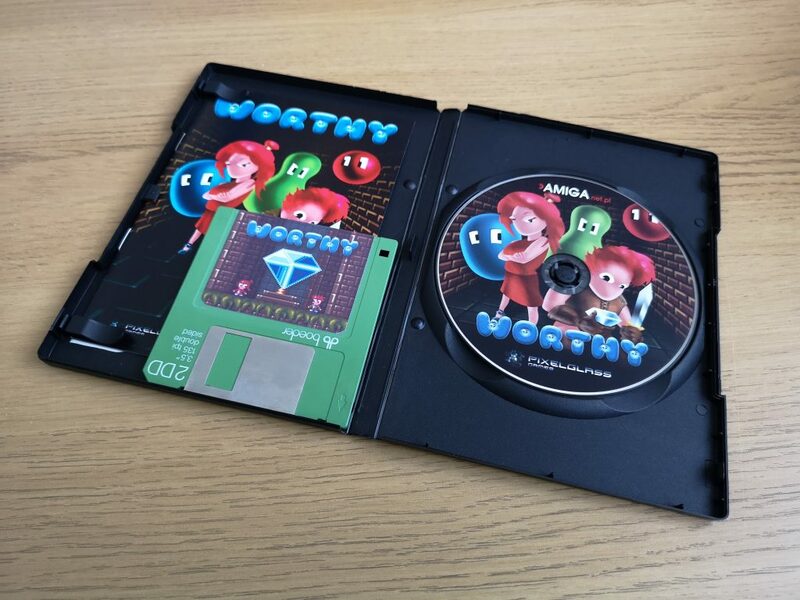 It includes both a CD and Floppy Disk copy of the game plus a digital version too so all bases are covered! 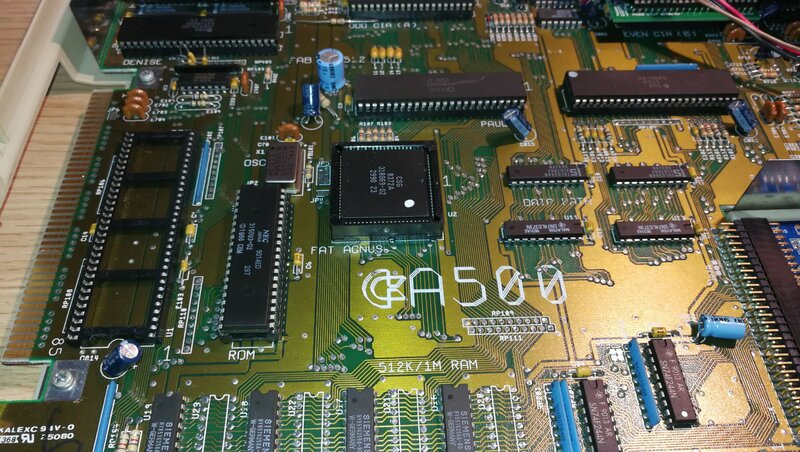 It’s an OCS game so will work on the original A500 no problem. I have to say I was really impressed with the physical presentation. 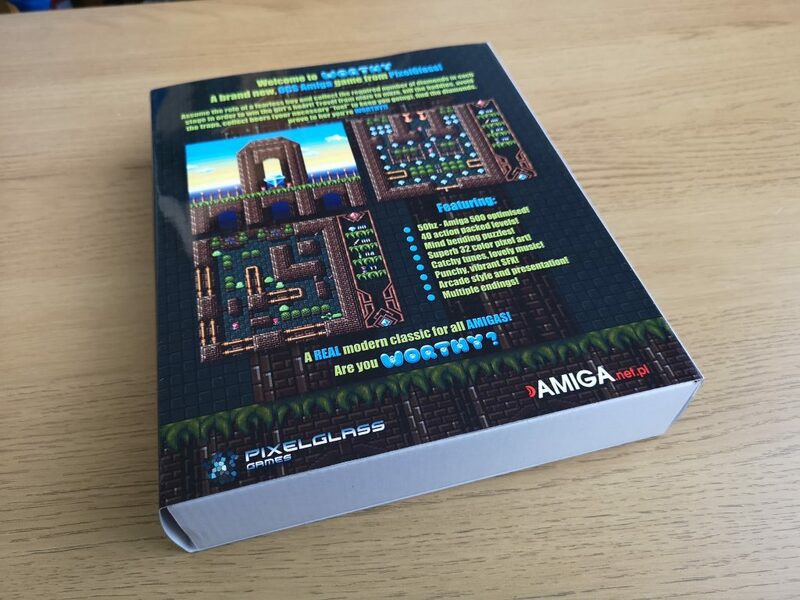 The packaging is very faithful to the type used back in the Amiga’s heyday with a large cardboard box and glossy outer sleeve. Inside is the more modern and mundane DVD case that houses the floppy and CD. I won’t bother reviewing the game as there’s plenty of info here but I will say I’m thoroughly enjoying it and it’s great to see new games making an appearance in 2018! 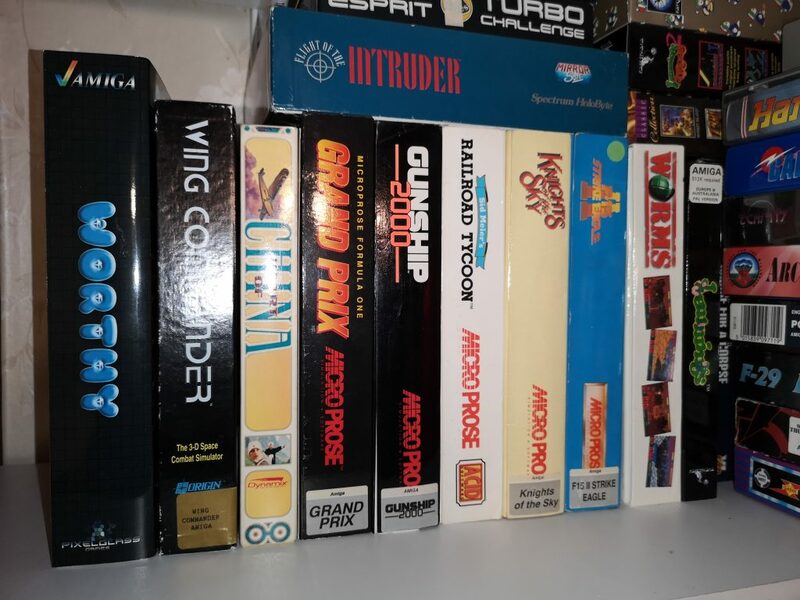 Anyway, here’s one final photo showing the game on a shelf alongside a few of my other Amiga games. It certainly doesn’t look out of place next to its much older forebears! 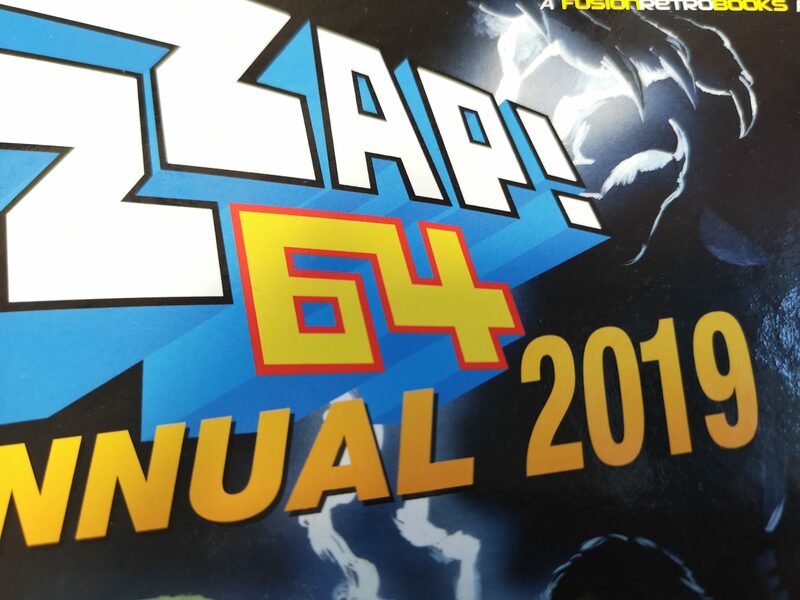 How cool is this, just received the brand new Zzap! 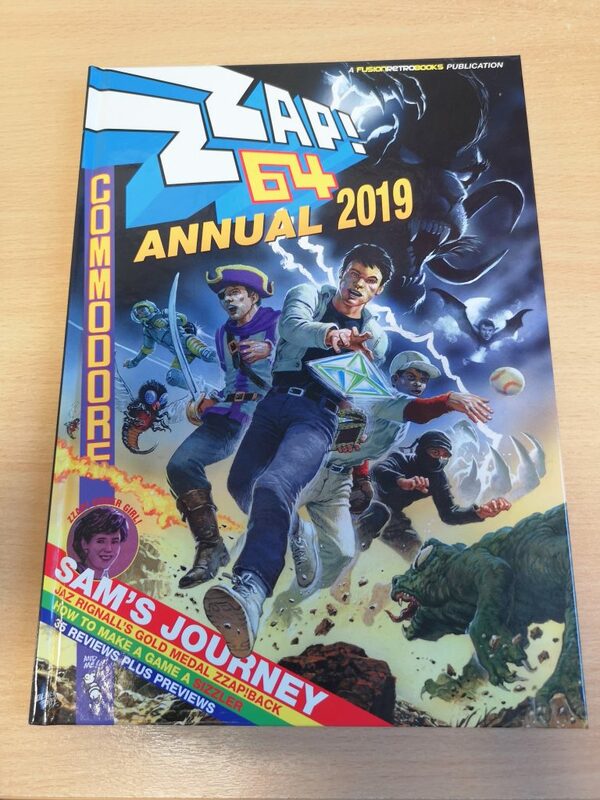 64 Annual 2019 through the post! This really takes me back to my childhood when every Christmas I would get at least one annual in my stocking. I used to love receiving these as they were always crammed with content that I could while away the hours reading in my bedroom. 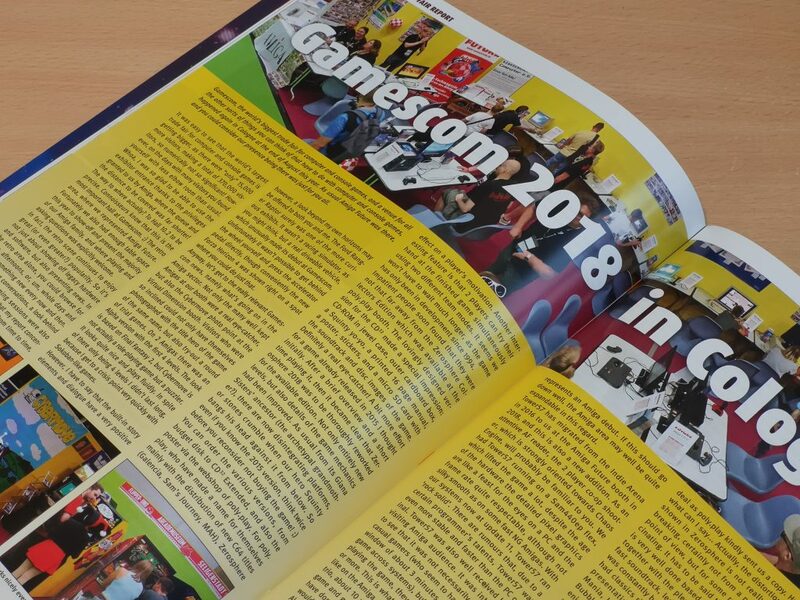 This is no exception, in fact it may be the most jam-packed annual I’ve ever had with nearly 130 pages bursting at the seams with fascinating 64 related articles, reviews and information. I backed this project on Kickstarter earlier this year and am so very glad I did. 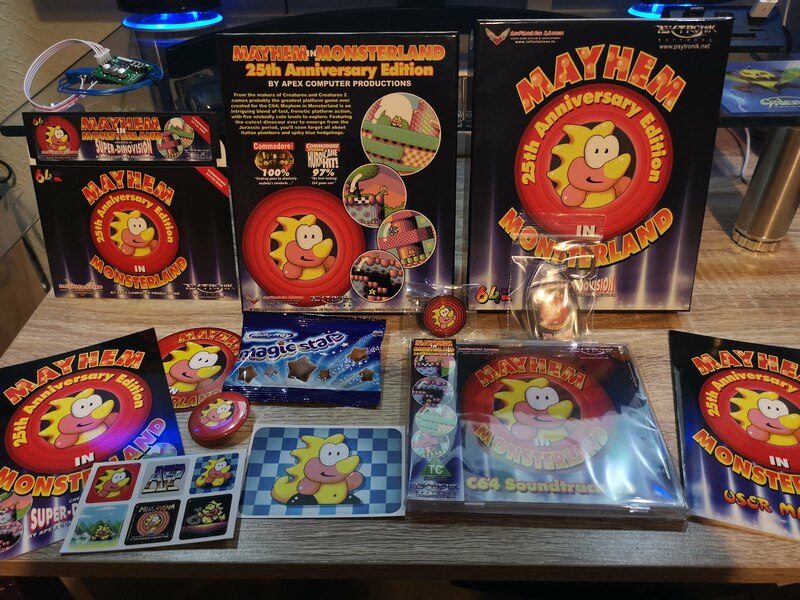 It’s probably one of the quickest (to finish) campaigns I’ve ever backed with the whole thing taking around 6 months from backing to receiving the goods. 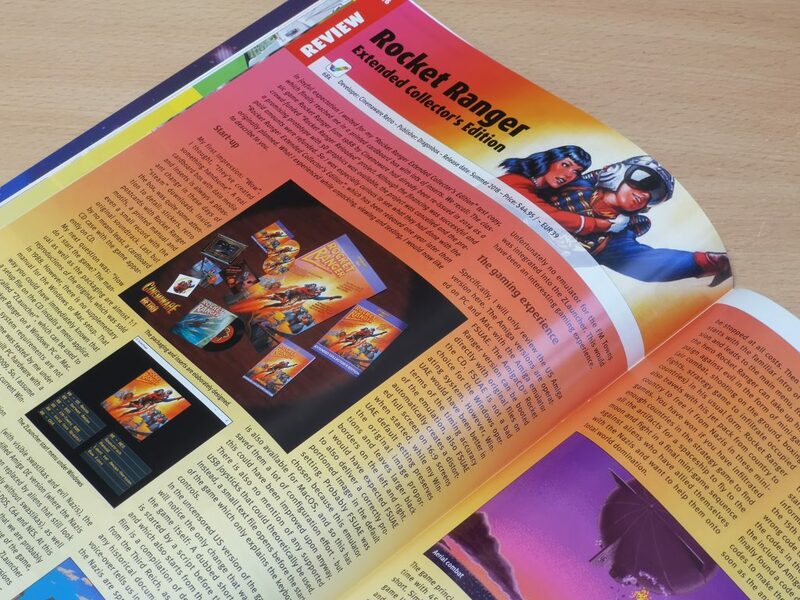 The cover had been kept under wraps so that it would be a surprise and features original artwork by Oliver Frey. Oliver’s work seems to be popping up all over the 64 scene of late, but needless to say it’s another quality illustration. There’s also a 2019 calendar included that’s packed with more of Oliver’s handywork and I can’t wait to display that on my wall come January. 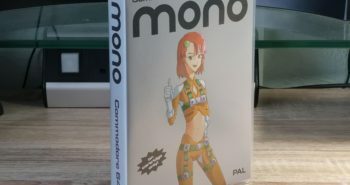 The art style and layout is instantly familiar. I’m delighted to see they’ve revived the little caricatures of the reviewers although they have ‘aged’ them to reflect the fact that these guys are now some 30 odd years older! But then aren’t we all…? It doesn’t just cover stuff from the past though. 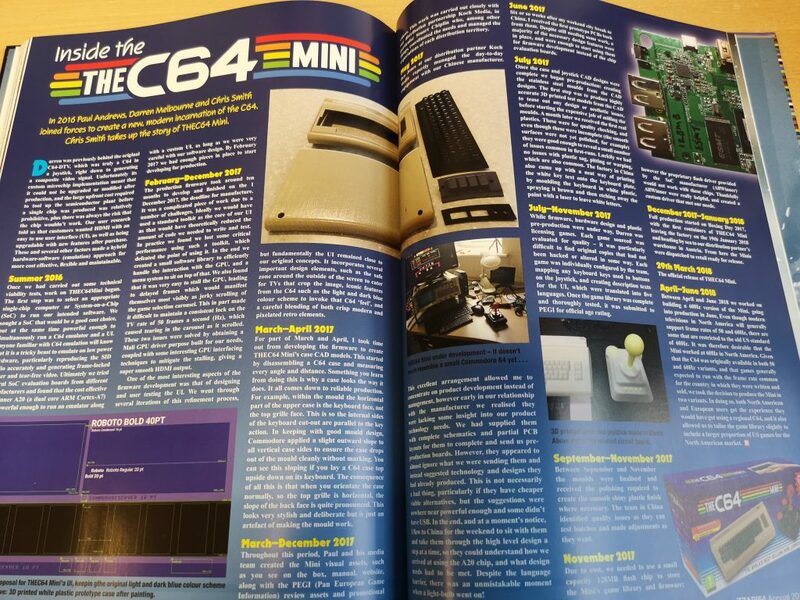 There are plenty of articles and reviews about the current the Commodore 64 scene including an in depth look at The C64 Mini that released earlier this year. All in all it’s a fantastic read and one of the best projects I’ve backed on Kickstarter so far. If they decide to make another annual next year (which they are already talking about) then I’m all in. 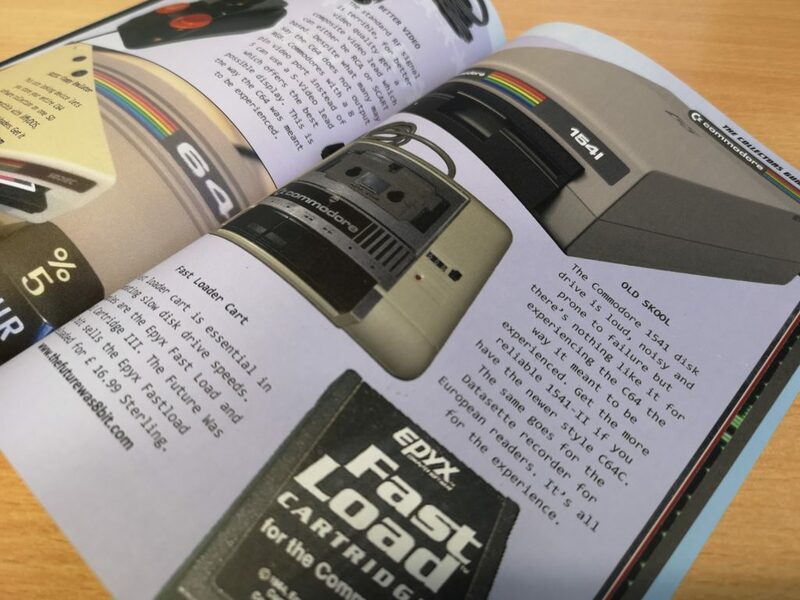 The C64 Mini gets an in-depth looking at! 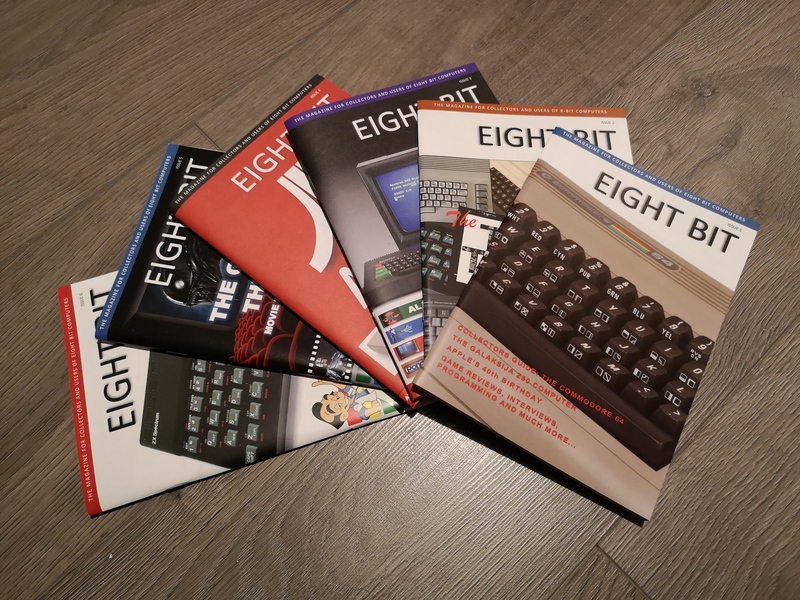 Now that the Kickstarter is over it looks like you can buy the annual directly from the Fusion Retro Books website for £15 although how many extra copies they made over and above the Kickstarter ones I don’t know.